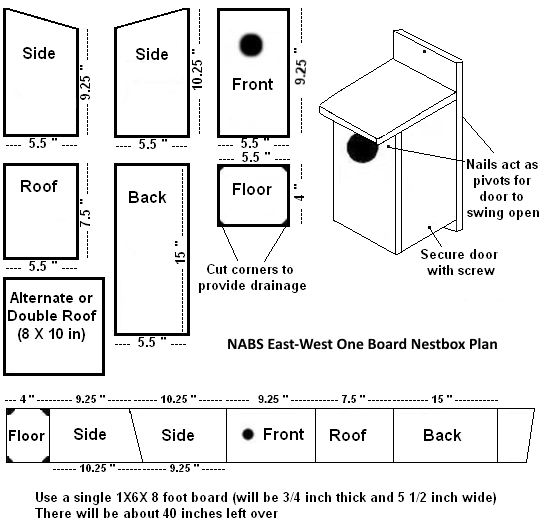 There are many types of bird house designs that you can use to build your own backyard nest box. Which should you choose? That partly depends on your goals. Do you want something that is more for decoration and if any birds use it or not, that would be just a bonus? Or do you want to specifically attract certain species of birds to use your bird house such as bluebirds? If the former is what you want, then any design would do. 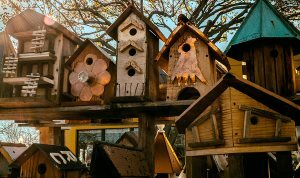 If the latter is more of what you are thinking of, then the bird house design you choose is very important in determining which birds do or do not use your next box. Birds will not care what color your bird house is, whether it has intricate carved designs or cute little welcome signs. Those elements are for us. Birds ultimately want a nest box that will shelter them and their eggs and nestlings from weather and predators. A bird house's location and placement is also a factor. Hole size and dimensions of the bird house will also play a role in determining which birds will nest and which will not. Most bird houses will have the basic elements of a sloped roof, floor and four walls - one with an entrance hole. It is also always nice to have one of the side walls lift up on a pivot for cleaning and monitoring. There should also be holes for drainage and the wood, if used, should be untreated and thick enough to provide insulation both from cold and hot temperatures. You may also need to install some type of predator guard, such as a baffle, to keep unwanted guests like raccoons, cats or snakes from entering. As mentioned earlier about designing bird houses for certain species, there are different designs just for bluebirds - whether you are building one for Eastern, Western or Mountain Bluebirds. More information about those plans can be found on our Bluebird House Plans page. 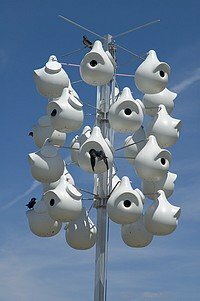 Purple Martins nest in colonies, so that type of bird house pattern is of course completely different as well. You can build both multi-level and multi-room designs, depending how many martins you wish to attract, or have several gourds (natural or manmade) hanging in a cluster. Here is more about Purple Martin Bird House Designs and Gourd Birdhouses. If you are unsure about what kind of birds or design you want, check out this page which includes a Bird House Dimensions Chart for 34 bird species. Attract house wrens, Carolina wrens and Bewick's wrens with these easy plans. How to build an American Kestrel next box. Everything you should know when building a bird house including material type, whether or not to paint or use sealer, entrance hole shape, perch or no perch, roof slant and more. Excellent wooden bird house designs, very easy to maintain and extremely durable. Winter Bird House Plans - Build a special shelter for birds to use during the cold winter months. Bird House Designs - More tips about building bird houses.